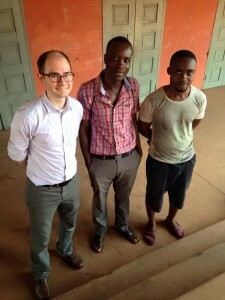 Cutter recently teamed up with the charity Sun Screen IT for an exciting project in Ghana. 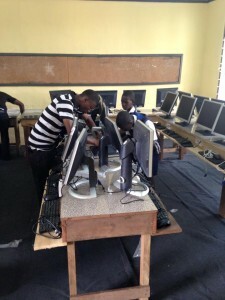 The objective was to provide the PCE Demonstration School in Akropong with a new teaching classroom of Sun Ray thin clients providing a virtualised desktop environment running educational software. Cutter donated the server and client equipment and sent me along to carry out the installation. It was to be my first visit to Ghana, my first time in Africa in fact, so I was really excited to be involved in the project and have the opportunity to see a new part of the world. I met Nathaniel Comer, the inspirational founder of Sun Screen IT, and Charlie Lort-Phillips, who would be documenting our time over there on film, for the first time at the airport and we set off on our adventure. 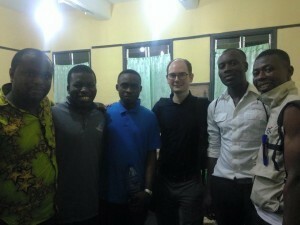 We flew to Accra taking all of the server and client equipment with us. After a long and nervous wait for all of the equipment to come off the plane safely the teaching and support staff from the school helped us to transport all of the equipment up to Akropong. It was nice to get away from the heat and humidity of the capital and up to the more pleasant climate in the mountains. Akropong is a beautiful place with fantastic scenery and I was feeling very lucky to be there. 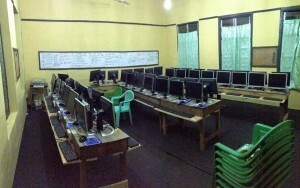 The next day I began work on the server build and we had a chance to visit the school where we got to meet staff and students who were all looking forward to using their new IT lab. We heard the history of IT in the school, failed projects where fat client PC’s had been donated in the name of charity in the past but had to be scrapped because of component failure, the high cost of powering the equipment and the lack of staff to maintain the computers. For this reason we could see that super efficient low power thin clients were going to be the perfect fit for the school where power cuts can happen frequently and the temperature in the classroom with no air conditioning would make it very uncomfortable to run a full set of power hungry PC’s. While I worked to complete the installation of the servers, staff and students pitched in to help us get the clients all cabled up and connected in to the system. Once we had finished our work we were happy to have a full classroom of 50 Sun Ray clients all set up and working on a virtualised RDS farm with some really useful teaching applications installed and ready to use. 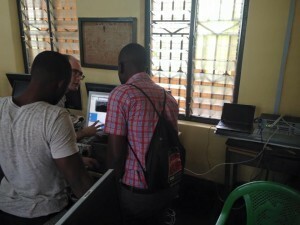 Time was spent with the local IT experts, Charlie and Nana-Kwame, and we ran through some of the basic server and client maintenance tasks as well as establishing remote access so that we can continue to support the system remotely from the UK. The teachers had their first chance to work with the system and were excited about the potential learning opportunities afforded to the students. In the evenings we were very well looked after by the school staff who introduced us to the local nightlife and treated us to some of the food and drink that Ghana has to offer. It was great fun! My final day before heading back to the UK was Easter Sunday and we were invited along to the Easter celebrations at the local church where we were fully introduced to the community and it was explained what we had been trying to achieve at the school. Everyone made us feel very welcome and showed us their gratitude for the work we had carried out. It was a real pleasure to be part of the celebrations and see the whole community come together with lots of singing and dancing followed by some great food. My new friends from the school travelled to the airport with me later that day to see me off and gave gifts for me to take back home. I was very sad to say goodbye.